Histories of musicology have often posited that crowds can only enjoy a performance as much as the performer derives pleasure from their instruments. As anyone who’s seen a saw player or most lad-rock bands can attest, there’s plenty of evidence to contradict that idea. But a Thomas Truax gig would be a perfect exhibit for the essayists. That said, the American exponent of what some have termed ‘freak-folk’ frequently appears less in synergy with his creations than embroiled in a battle with physics. Without knowing the intricacies of his inventions or much of music theory, his key handmade instrument, Mother Superior, appears to us to rely on a kind of spinning clockwork mechanism which dictates the pace of an automated drum. The precision this entails throws his songs off kilter when it goes awry. 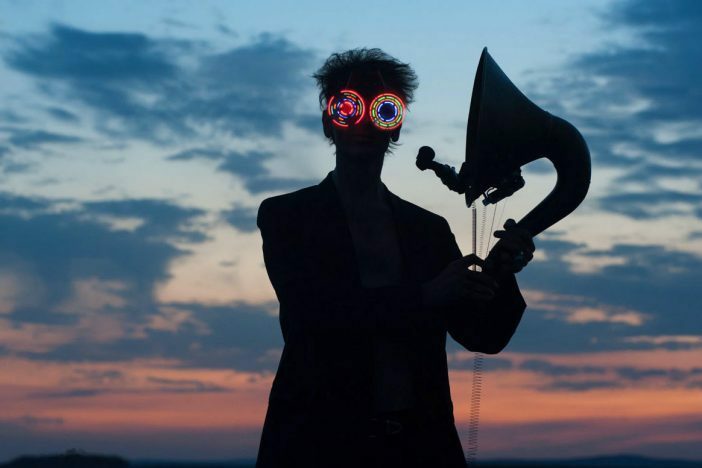 But Truax, with his grasshopper limbs and love of David Lynch, is keenly alert and highly experienced at adapting to what he defines as the temperamental personalities of his instruments, and his other stalwart, the much-loved and beautiful Hornicator, provides plenty of its own vagaries to contend with. Truax’s art could be an exercise in professorial indulgence were it not for the extraordinary music he creates amidst the unfolding chaos. At first, he surfaces in the crowd, having been at the bar tuning up a guitar with three mini horns on it. He occasionally stops and looks around, as if trying to make sense of how he got here, or giving the circle a chance to take stock. Once he’s on stage he clamps an accordion, with what looks like three more small horns, around his head. Then he’s off, out of the room, possibly onto the outside stairwell, all the while singing about Wowtown, his fictional little hometown where the seasons rarely fluctuate. For the homage’s finale, he’s helped onto the merch table at the back via a stool, and then balances out the bizarreness with a beautiful song about dancing with death and waltzing through life once he’s back on stage, the Hornicator accompanying him mournfully as he describes the “moving target” of happiness. It’s tempting to suggest Truax is always better live than on record, and not just because of his unique approach to interaction and risk. Without visual context, it’s impossible to appreciate just how bewilderingly unusual he is. ‘Everything’s Gone Halloween’ sounds a bit like a novelty ghost ride at a cheap funfair in its studio guise, but tonight it sends a load of whistles soaring and scratching against each other, seemingly from nowhere, against a Coen Brothers score beat. Truax presides like a friendly dark lord. The effect is about as disconcerting as you can conceive the sound of a man on stage being without becoming fatally peculiar, and that’s why you feel so invested in the performance from the start: besides the physical barriers between Truax and his audience being broken down to the point of co-dependency, his brilliance frequently teeters on the brink of disaster, and could easily translate into abrasiveness in inexpert hands. He’s a comedic and shamanic figure, somewhere between the up-in-smoke flamboyance of Arthur Brown and the devotional busking of cult vagabond Jason Webley, and any attempts to copy his approach would almost certainly sink without trace. Truax strikes an imitable tone of theatricality and gonzo experimentalism. By the end, he’s attached a string to the wall from a kind of plumbing tube, and then shortens the length between himself and the wall. Twanging away, he clasps the whole contraption to his neck and lets off various chirruping sounds from it, all to the looped echo of his own voice, which mimics sleep-talking before ending in a deep snore. You half expect Truax, who is wearing some huge, severely psychedelic glasses at this point, to disappear in a puff of smoke. Mother Superior and the Hornicator need him, though. Even when the synchronicity stutters, theirs is a ridiculous formula with inspired returns.